NASA's Extreme Access Flyer will investigate the inaccessible corners of asteroids and planets, atmosphere or not. A team of NASA engineers wants to put drones on Mars. These flying robotic sentinels could reach more of the Martian surface, and possibly solar system moons or the dark, sunless craters on asteroids. Autonomous quadcopters — the four-propeller flying craft commonly called drones— are fast, flexible, use little power and can get into (and out of) tight spaces. But they work only with an atmosphere to propel through. Now, the Swamp Works team at NASA's Kennedy Space Center in Florida is developing a dronelike robot that works in dark, low- or no-atmosphere environments, and can recharge itself by returning to its lander mothership. The new machines are called Extreme Access Flyers. Instead of rotors, they use jets of oxygen gas or water vapor to move around, whichever gas is available on the planet or asteroid the robots are exploring. With that fuel, they can zip around and forage for soil samples in areas inaccessible to traditional landers. The final version would be small enough to bring several to the surface on a lander, and they would carry enough fuel to get where they needed to go, the craft's developers say. "It would have enough propellant to fly for a number of minutes on Mars or on the moon, hours on an asteroid," Mike DuPuis, aerospace engineer and co-investigator of the project, said in the statement. 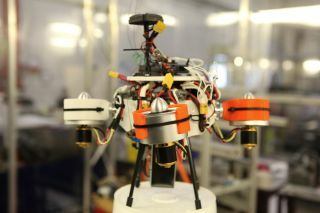 The Swamp Works laboratory is already swarming with models to test the technology, ranging from a 5-foot (1.5 meters) quadcopter, likely the size of the final craft, to tiny, palm-sized flyers. The large flyer is used to test out movement over different terrain, borrowing a test site built for the SUV-sized Morpheus moon lander. Researchers use the smaller flyer to test maneuvering and software control by exploring inside a 10-foot by 10-foot cube (3 m by 3 m). Researchers suspend another small flyer inside a frame that allows it to maneuver as if it hangs in zero gravity; that flyer propels itself with liquid nitrogen, and its twists and turns are re-created on the surface of a virtual asteroid. The final craft will combine autonomous exploration with mapping and laser guidance to get around the changing terrain and find its way home. "The flight-control systems of commercially available small, unmanned, multi-rotor aerial vehicles are not too dissimilar to a spacecraft controller," DuPuis said. "That was the starting point for developing a controller." The Asteroid Prospector Flyer prototype in a testing gimbal. Once on the surface of a planet or other object, the flyers could carry one tool at a time to target locations to take small samples of about 7 grams (0.2 ounces) of material. Over the course of several trips, the flyers would get a complete geological picture of an area, NASA officials said. Similar flyers could also grab samples in toxic or radioactive areas on Earth for measurement, Mueller said. And the craft could explore inaccessible tubes formed by the flow of lava, on Earth and off. Mueller suggested that a large lava tube, pre-mapped by such an explorer, could even provide shelter for humans on the surface of Mars. "We're an innovations lab, so in everything we do, we try to come up with new solutions," Mueller said.